Gordon joined the gang in 1990 and was featured in several of my live puppet shows. He quickly became my favourite puppet from all of those that I had made up to that point. As I've performed so many live shows with Gordon I've seen how much kids love him. After talking with him they often like to give him several hugs and kisses when they say goodbye. 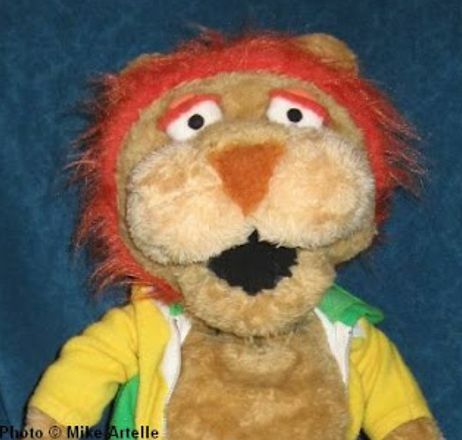 He's a very soft and huggable puppet who has made many, many young friends over the years. Gordon is a kind and caring sea monster who likes best of all to hang out with his friends, the Fuzzy Gang. He hatched from a 500 year old egg that was found by an archeologist near the Bay of Fundy. Gordon is often confused by people who think that he is mythological and has therefore developed an identity crisis. In addition to sometimes doubting his own existence, Gordon often wonders if he isn’t just a dinosaur or a dragon instead of a sea monster! Wearing his insecurities on his sleeve next to his heart, Gordon is on a quest to learn why he cannot find any other sea monsters and what became of his kin. Gordon’s nemesis is Captain Spatula whose quest is to capture Gordon! In the late 1990's I had bought a motorcycle and spent a lot of time riding around with some of my college buddies. 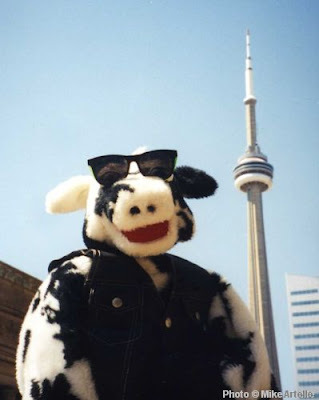 This influenced my creativity and I thought it would be funny to have a biker cow character who likes wearing leather, so I created Hornz in 1996. (His leather vest was given to him from an uncle, literally, along with his belt, boots and wallet!) I named him Hornz as a parody of one of my favourite TV characters, the Fonz. I'm a huge Happy Days Fan!!! 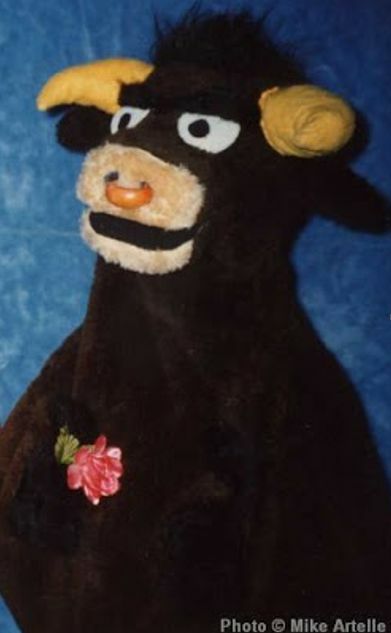 Around 1990 I had made a cow puppet for my Jack and the Beanstalk live show. That puppet was named Milky and was a normal four legged cow with a wire frame to keep it standing up, so it couldn't be used like a TV-style Muppet character. I really liked the head on it though, so after I had stopped touring that show I took off the cow's head and made a new body. This became Hornz the Cow. 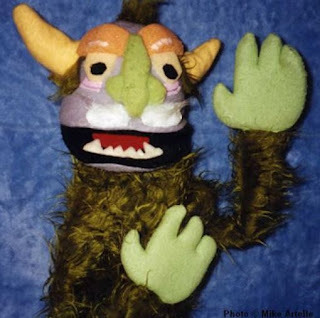 Unfortunately I have yet to feature Hornz in his own live puppet show, but he's a fun character to interact with whenever I'm doing puppetry demonstrations or showing my puppets to people. The coolest “cowboy” around, Hornz the Cow might look like a rebel but in truth he’s a catalyst! Through his family lineage Hornz inherited the role of “the cow that jumps over the moon”, which he does in style on his special motorcycle “Moon Jumper”. An accomplished and admired daredevil biker cow, he is the Evel Knievel of the nursery rhyme crowd. Hornz owns the farmhouse where Gordon and the rest of the Fuzzy Gang live. When Gordon first moves in Hornz apologizes for the mess, explaining that he used to live in a barn. When asked why he doesn’t have an udder, Hornz becomes confused and asks “Another what?” People tend to think that Hornz is a Holstein cow but in fact he’s an albino, those spots are his tattoos! 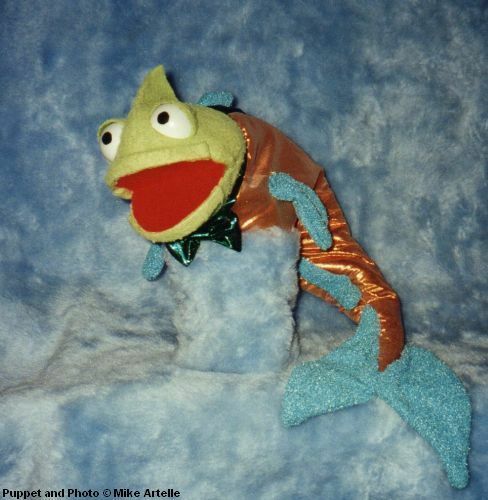 In the late 1980's I did a puppet show based on the Three Billy Goats story and added Mr. Fishy to the cast. He lived in the river under the bridge and complained about the Troll moving in. With his neat bowtie and friendly face, Mr. Fishy is a nice little puppet that was used in several of my other shows as well, including "The Pirate Mice", "The Fisherman and Golden Fish" and a puppet video project titled "Fuzzy Fables: The Sea Monster and the King". Mr. Fishy is a golden fish with a heart to match. His Fuzzy Gang friends consider him to be Gordon the Sea Monster’s side kick as the two are often inseparable. At times it seems to others that Gordon is being quite silly carrying Mr. Fishy around with him for no particular reason. On the contrary, Mr. Fishy enjoys his role helping Gordon to learn about the modern world, as well as other important details… such as how to swim! Although Mr. Fishy can stay out of the water for extended periods he cannot stay out indefinitely. A very talented fish, Mr. Fishy can tap dance and walk about on his hind fins. His advice is highly valued by his Fuzzy Gang friends, who often turn to him for guidance and wisdom. Mr. Fishy is fearful of being captured by Captain Spatula, as the old pirate has many frying pans aboard his ship and is ruthless enough to use them! Jeremy is another puppet created for my Jack and the Beanstalk puppet show in the early 1990's. 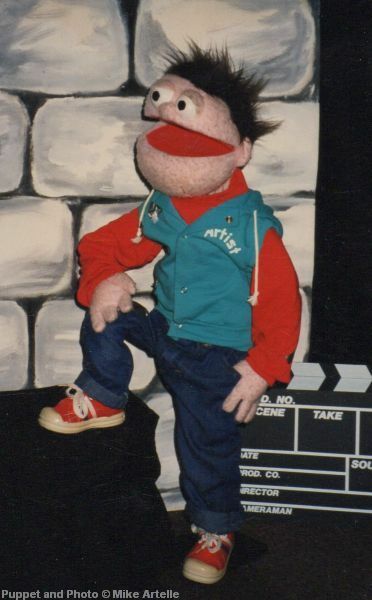 The puppet for Jack later became Jeremy, and one of my main puppet characters that was used in several different projects. Jeremy replaced one of my earlier characters, Rob the Slob. When I built Jeremy the puppet was intended to be the third version of Rob the Slob however I had tried sculpting the puppet's head out of foam and covering it with fabric, instead of sewing and stuffing a fabric shape as I had previously done. In the end the new puppet didn't end up looking like Rob the Slob so it became Jeremy. Jeremy is the adventurous and outgoing puppet boy with a quest for knowledge and a desire to explore the world. A curious little guy who often finds himself in trouble, Jeremy fancies himself as a connoisseur of the adventure genre due to his exceptional and extensive collection of comic books. Easily carried away by his over active imagination, Jeremy’s antics are often over the top and innocently idiotic. This, along with his knack for being accident prone and clumsy, often establishes Jeremy as the unintentional source for the Fuzzy Gang’s numerous life threatening predicaments. His saving grace is that he’s a wizard with computers which helps the Fuzzy Gang solve mysteries… and he’s cute too! Here's Bruno the Dog! 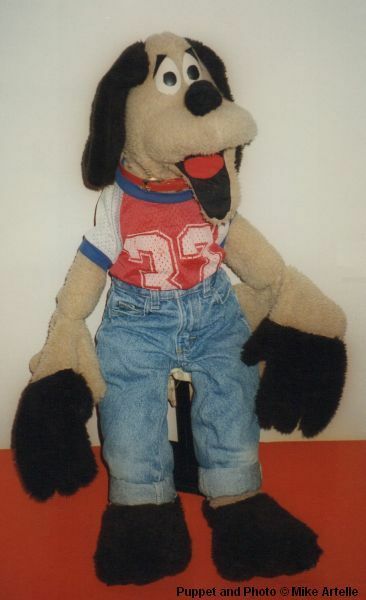 He was built sometime between 1986 and 1988, and is the very first puppet that I made with store bought fake fur. I named Bruno after one of my High School classmates. Bruno appeared in a Christmas puppet show called The Case of the Snowman Toppler, and I also performed with him on the first season of CJOH TV's Homegrown Café. He later had a comical role in a theater production that was mounted by my high school drama class in 1990 called A Space Oddity, which I wrote and directed. Bruno is a country dog and likes to embark on adventures with his Fuzzy Gang friends…. he’s quite good at embarking. Although he’s a friend to man his best friend is a cow, Hornz the Cow, the famous moon jumper. The two have been pals since childhood when Bruno was a little dog and laughed to see such sport. Naturally, on hiking expeditions Bruno is the Fuzzy Gang’s trusted navigator. Out of all the trips they’ve taken he’s only gotten lost twice, so on their third trip he's going to bring a map! Should Bruno get the team lost again they may begin to wonder who let this dog out? 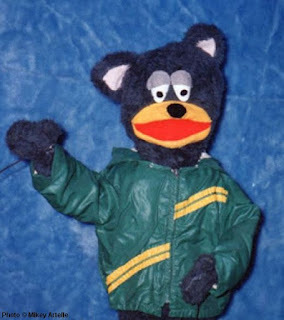 Another of my earlier puppet characters is Tyler the Bear. He was built shortly after I made Bruno the Dog (shown above). I was actually attempting to make a cat when I built Tyler but he ended up looking more like a bear, so I just went with it. This explains why his ears are a little bit pointy. The green jacket that he's wearing is a hand-me-down that both of my siblings and I wore when we were kids! From the popular fable of the Three Bears, Tyler is the little bear who is now a teenager. Very shy and quiet, he likes to spend most of his time alone out in nature while drawing in his sketch book. Often copying down what he sees, his art work comes in handy for solving clues during adventures with the Fuzzy Gang. Unlike the rest of the group, Tyler has an introverted personality and at times has trouble in social environments. Though he feels welcomed to join his friends, Tyler will often wander off to be alone and marvel at the clouds in the sky or the leaves in a tree. Seeing the world in this way, Tyler approaches situations with gentleness and an endearing character. When I was in grade 11 or 12, sometime during 1992 or 1993 during my late teens, I built the head for a new Lion puppet character. Unfortunately for Brian, I didn't finish the body until a few years later in 1995. 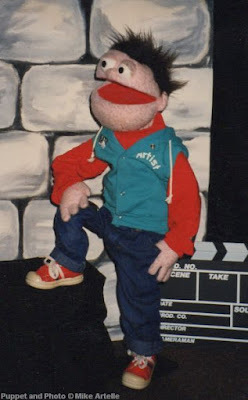 That same year, I attended the 5th National Puppetry Conference in Waterford Connecticut, a week long event that was held at the Eugene O'Neil Theatre Centre. I had previously attended puppetry festivals and various workshops, however this was the first time that I had gathered to work with other artists who, like me, all had a serious passion for puppetry. It was quite a remarkable experience, and overwhelming in a good way! Gordon the Sea Monster, Mr. Fishy, Tyler the Bear, and Brian the Lion, came along for the trip too. (It was a challenge to get a Lion through customs!) During the conference I began to create a new story about Gordon called The Sea Monster and the King, for which Brian became King Brian the Lion. Although he is a proud and generous ruler, King Brian’s grasp of leadership is tenuous at best. He often helps the Fuzzy Gang during their adventures, though he lives in a castle in a distant kingdom which can only be found by those who truly believe in magic. For this reason, upon meeting the King, Gordon the Sea Monster gave him a cell phone! (Seriously dude, get with the times!) So now King Brian is just a phone call away! As my mother Peggy helped out as a puppeteer with most of my touring live shows, Mousie Mousie was added to "The Three Billy Goats" show as an additional character for her to perform. At first my mother had difficulty doing different puppet voices so we wrote Mousie into most of our shows from this point on, which became an inside joke for us. It worked out well as kids really liked the character. 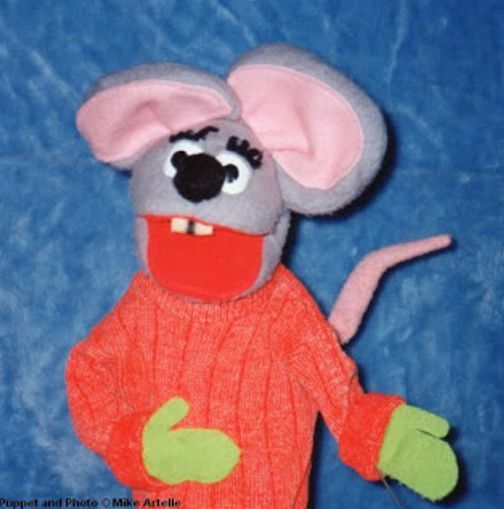 In the late 1990's I gave the Mousie puppet to my mother and she continued to perform the character in shows for the Ottawa Puppetry Club. In the early to mid 2000's, my mother formed a company with a puppeteer friend from the club, Sharon Wuepplemann. They called their troupe Pegaron Puppets. Mousie Mousie made appearances in several of their shows too, one of which was called "Mousie's Menagerie". A spunky and outgoing mouse who likes to wear her mittens year round, Mousie Mousie has a habit of saying things twice-twice! Nimble and quick, she is an asset to the Fuzzy Gang team when in need of the proverbial “key in the giant’s pocket”. Although she is smart, her addiction to cheese often gets her into dangerous situations. Thankfully her Fuzzy Gang friends are always there to spring her out of the mouse trap. 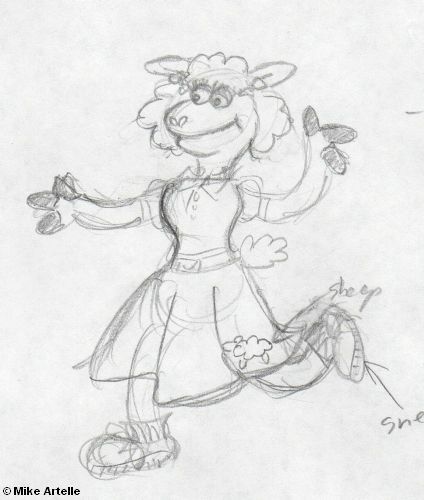 Here is a sketch of Hornz the Cow's girlfriend Lamby Lynn, dated Sept 9 1996. 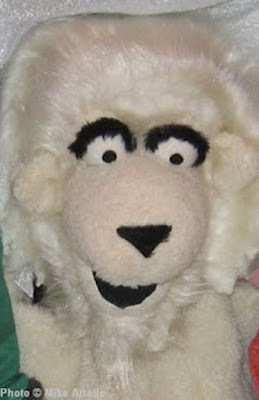 I have yet to make a puppet of Lamby but have always thought of her as part of the Fuzzy Gang. Lamby Lynn is a very pretty lamb but she’s also very clumsy. She couldn’t jump over a fence if she tried. Lamby Lynn's boyfriend is Hornz the Cow whom she met in school one day after her friend Mary introduced them. They fell in love while grazing. At one point when Hornz and Lamby briefly broke up, Hornz dated a border collie who was a sheep wrangler, which Lamby has never gotten over so it’s best left unmentioned (it’s still a source of friction!). Her father is Mr. Wolf who tends to huff and puff whenever Hornz brings her home too late in the evening. She once knitted a sweater for her father but he never wore it. He didn’t want to be a wolf in sheep’s clothing. The first show that I created for Gordon the Sea Monster in the early 1990's was "The Pirate Mice". Along with Mousie Mousie and her brother Peter Mouse the show featured a pirate named Captain Spatula who became Gordon's nemesis. I had built Captain Spatula in the late 1980s before I made Gordon, so this was the first time that they were paired up together. My mother and I liked thinking of funny pirate expressions for the Captain to say, such as "Blubberin' Blowfish!" or "Sufferin' Seahorse!". When Captain thinks someone is less intelligent than he is or has made a foolish mistake, he calls them a "Bumblin' Barnacle"! 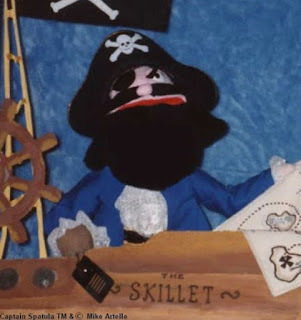 Ruthless and untrustworthy, especially if we’re talking about his cooking, Captain Spatula is the fabled and fearless pirate of Lake Ontario! Surprisingly, he’s quite the ladies’ man when it comes to mermaids, but would rather spend time in the kitchen aboard his ship “The Skillet” cooking up his favourite meal, seaweed pancakes! Dim-witted and deceptive, the Captain is very suspicious of sea monsters, especially Gordon! He has vowed to someday capture “the menacing purple fuzzy fiend”, and make a profit to boot! During the late 1980's or early 1990's I made puppets of a Matador and a Bull for a variety show skit set to music. Unfortunately Biff the Bully never made it into one of my regular puppet shows, but he came in handy for puppet demonstrations and workshops. Biff the Big Bully is a barnyard brute! Loud and brash, this “Toro Bravo” is the leader of a biker gang called the Tread Heads. He is a nemesis for Hornz the Cow who has left Biff seeing red on many occasions. Although Biff once got lost in his own labyrinth he still claims to be a smart Minotaur, especially since he got that Tattoo on his back showing the way out! One of my most popular puppet shows was "The Three Billy Goats". It was created sometime between 1988 and 1990. My mother Peggy and I performed it at several branches of the Ottawa Public Library and elsewhere throughout the city until the mid to late 1990s. Ned the Nasty Troll became a regular character in my shows and appeared in a short video with Gordon the Sea Monster that I made in 1997 called "Fuzzy Fables: The Sea Monster and the King". Lurking under bridges as a hobby, Ned the Nasty Troll has made it his life’s work to be mean and selfish. He enjoys causing problems for the Fuzzy Gang so much that he took a computer class just to learn how to troll online! 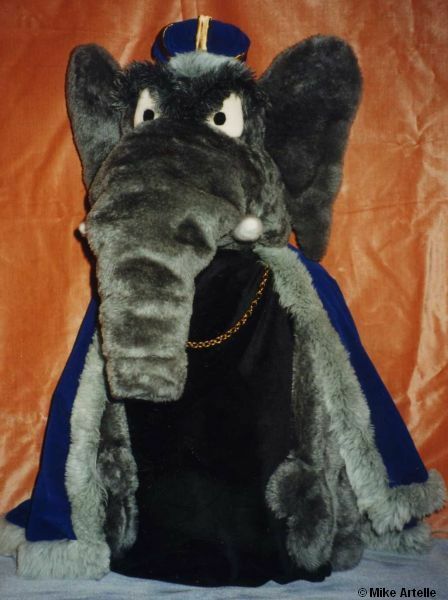 This is a rather large puppet of King Brian the Lion's nemesis, King Whitehorn the Elephant, made in the late 1990's. 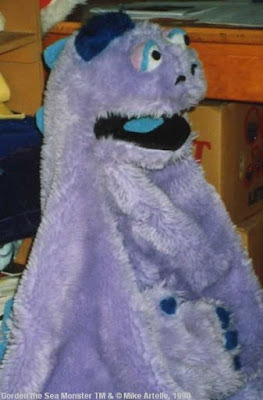 He has yet to be used in a completed puppet show however he has been included in several puppet displays and used for demonstration during workshops. 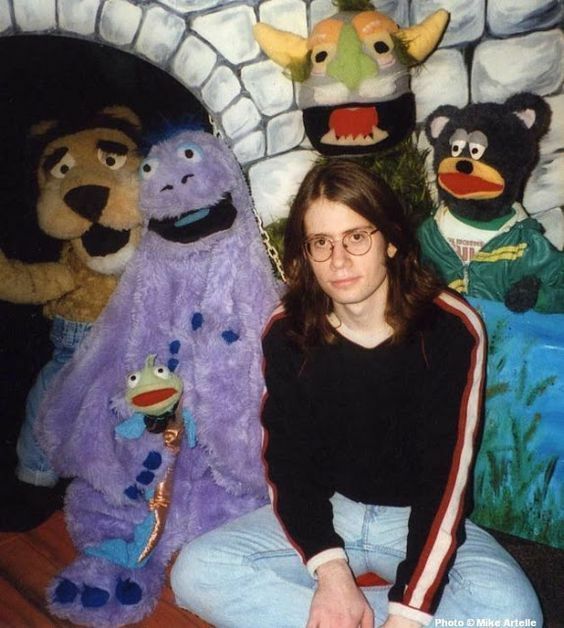 He was also briefly seen on TV in the late 1990's when I did an interview about my puppets. A nemesis for King Brian the Lion, King Whitehorn is the unscrupulous ruler of a neighbouring kingdom. Not content to have just one castle, King Whitehorn is constantly trying to manipulate King Brian into surrendering his kingdom. As he is so obsessed with scheming to gain all the power in this “fantasy world”, King Whitehorn is clueless to the modern world that lay beyond their magical realm. What will happen should he ever find out about it? That’s “the elephant in the room”! Here is another character that was intended for the Fuzzy Gang fantasy world but I have yet to finish. Darren was going to be a full body dragon costume. The sketch is dated November 1st, 1997. The idea behind his name, Darren Dragon, was to have his initials be D & D in reference to the popular role playing game. 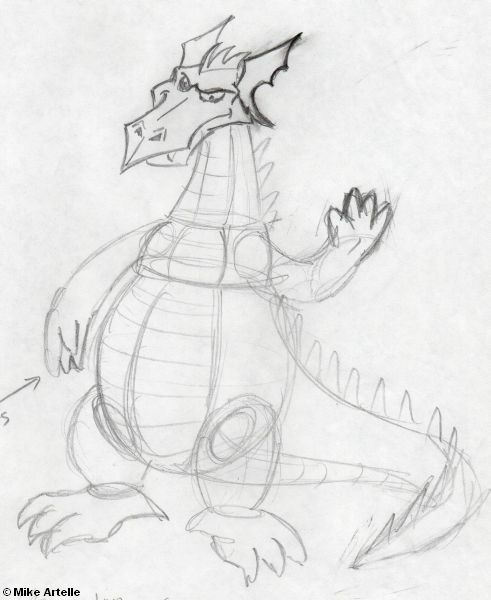 Darren is a big mean dragon that likes to attack King Brian's castle for fun and on a few occasions has teamed up with King Whitehorn as his goon. He has issues with hording and dislikes visitors because he is overly protective of his cave. 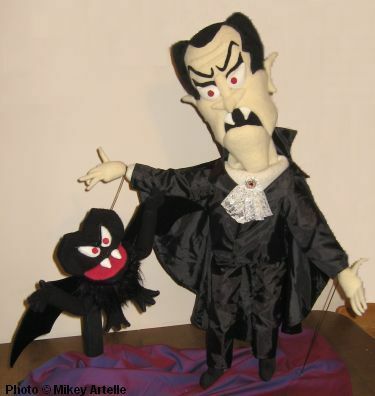 In 2000 or 2001 I made a puppet of Dracula for a Halloween show that I had wanted to do but have yet to finish. This is a very funny puppet that I really like, it's quite silly. In addition to Dracula I made a brown vampire bat and several prop pumpkins for the show. Having haunted for centuries, Dracula is feeling out of place in the modern world. Frustrated that children are no longer frightened of him, and inexplicably unable to activate his magical powers, the King of the Vampires has lost his mojo. Now clumsy and comical, Dracula longs for the good old days when his very presence would strike terror into people’s hearts. Determined to the last, Drac hasn't given up trying to frighten or hypnotise those around him, including his sympathetic friends from the Fuzzy Gang. This Pterodactyl character is one of the very first puppets that I ever made, back in my mid teens in the 1980s. Originally he was white but when I remade a new puppet of him in the mid 1990s he was reincarnated with light orange fleece. At this point I also gave him a nicer shape to his body and bulgy eyes. I had wanted to make his eyes blink but couldn't figure out a mechanism that would fit into such a slim puppet head. 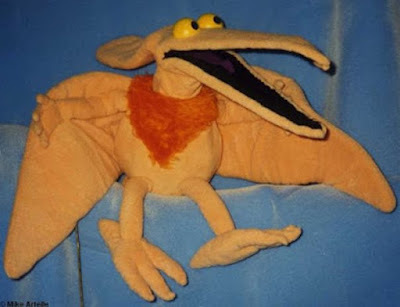 The Pterodactyl was intended for a show about dinosaurs that would have featured Jeremy in the lead role, but was never completed. Pterodactyl doesn't have a name, he's just "Pterodactyl". Over the years he has been used for several puppet displays and workshops and has traveled with me on occasion to puppetry festivals. Pterodactyl is a kooky bird brain who has a bad habit of flying into the sides of mountains, which is how he bent the tip of his beak. He is always nervous and easily spooked, as he worries about being eaten by everyone he meets. He especially dislikes being near a T-Rex! 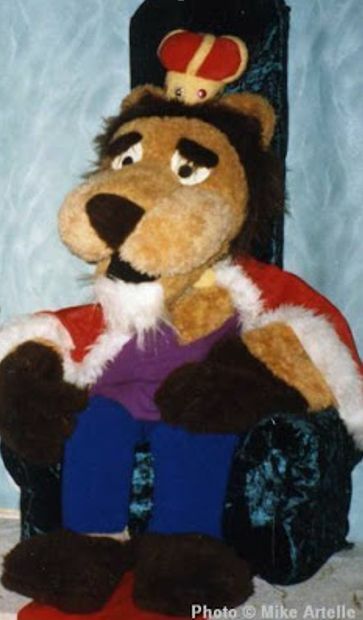 The Abominable Snow Monster was created for a show called "The Christmas Wish" in which Tyler the Bear and Mousie Mousie go to the North Pole in order to prove that Santa Claus is real. During their adventure they get captured by the Snow Monster but it turns out he just wants some friends to play with. He's actually a ram puppet from my "Three Billy Goats" show with some fake fur fabric added over his horns! The Abominable Snow Monster or “Abe”, as the Fuzzy Gang calls him, lives in snowy cave far up North. An outdoors type of guy, Abe likes to put on his swim shorts and spend the day snow-tanning at the frozen beach with a cold bucket of ice cream at his side, making sure to get all of his fur bright white. Then to cool up, he’ll take a relaxing dip in iceberg-cold water at the community “hole in the ice” along with the local walruses, penguins and elves. 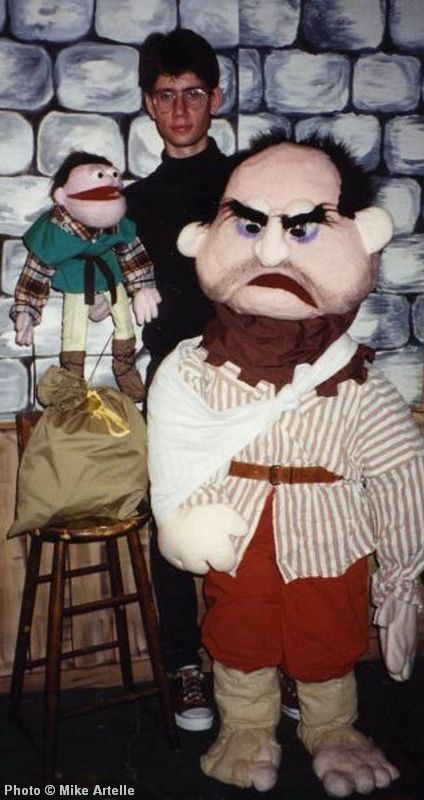 Here I am at age 19 or 20 with Jeremy as Jack and Gus the Giant, a five foot tall puppet, both made for my "Jack and the Beanstalk" live show in the early 1990's. Gus the Giant is pretty cool.